Earlier this week, we made mashed potatoes in the Instant Pot. Talk about a game-changer of a recipe. Once you make mashed potatoes in the Instant Pot–which requires zero draining of a liquid and only one pot–you’ll never go back to the stove-top method. At least I won’t be going back. 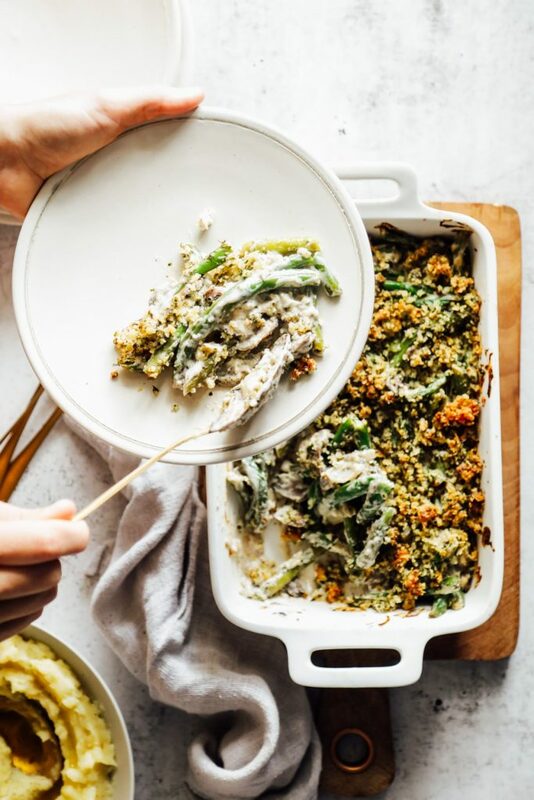 Today, we’re going to add to the Thanksgiving menu options with a “real foodified” version of a classic side dish: green bean casserole. Chardea (who works with me behind-the-scenes on recipes and computer stuff) is the one to thank for the sudden surge in Thanksgiving and holiday-themed recipes. I wasn’t planning on sharing any holiday themed recipes this year. The plan was to ignore the holidays. I promise, I’m not a Grinch. 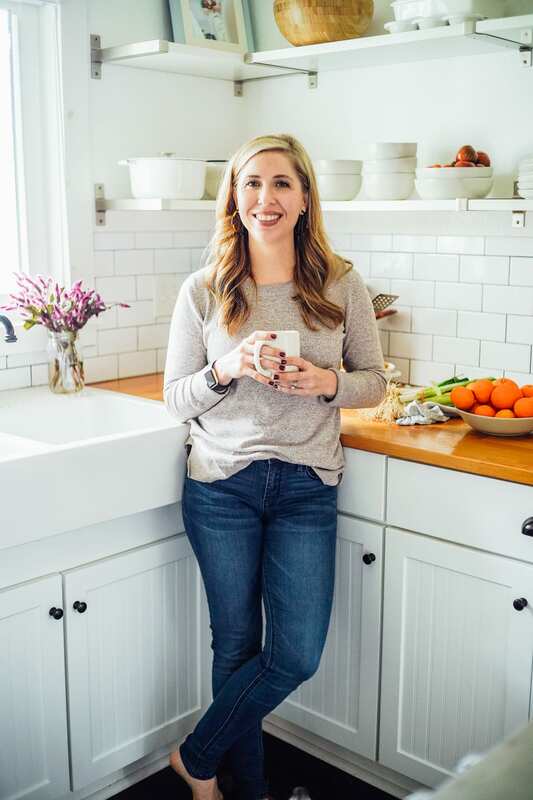 I just like to focus on bigger picture recipes and tips that will keep us going all year long. Plus, I don’t typically cook for holiday celebrations. My mom and Dustin’s grandmother still enjoy that responsibility–> #tradition. After listening to Chardea’s request, I figured she can’t be the only person in need of such recipes. There are a number of holiday inspired recipes on the blog right now–pumpkin pie, biscuits, stuffing, sweet potato biscuits, cranberry sauce, and a chocolate cream pie–but why not expand the collection? Helen took a couple of recipes to work on and I took the rest. As my six year-old says, “Team work is the dream work.” Between us, we’ve been testing recipes and now it’s time to share the recipes with you. 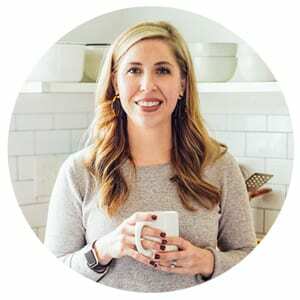 This year, we’re adding Instant Pot mashed potatoes, sweet potato casserole, einkorn biscuits, and green bean casserole to the holiday recipe collection. 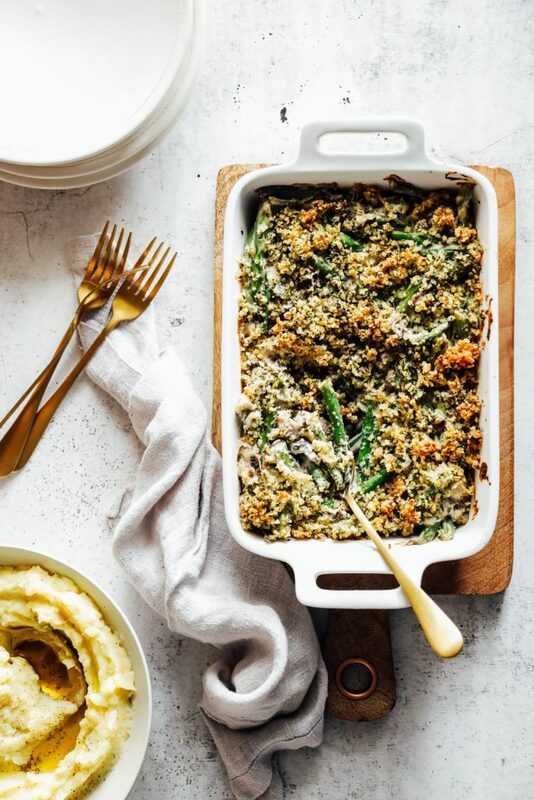 Today, let’s talk about green casserole. Traditionally, green bean casserole is made with condensed soup and fried onions, both of which are highly processed. 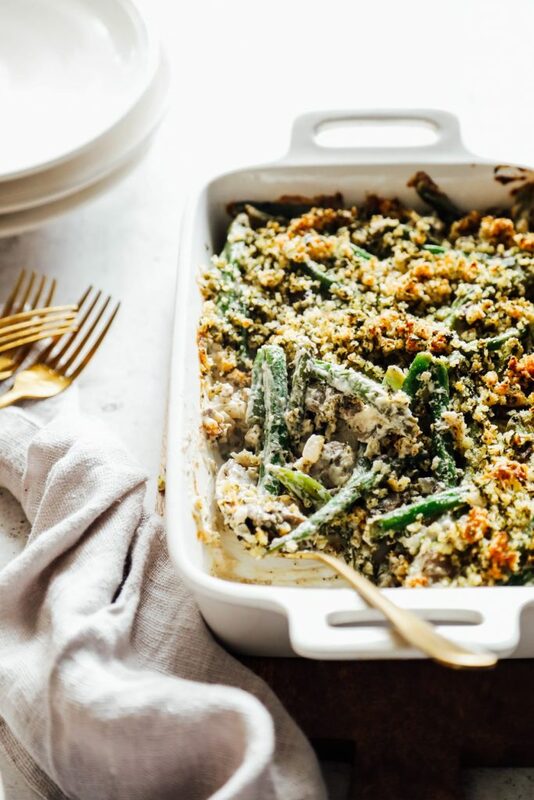 Green bean casserole is meant to be decadent and creamy–it is holiday food. 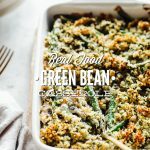 This real foodified recipe maintains the decadent flavor and texture of traditional green bean casserole, but skips the cans of condensed soup and fried onions. Instead of condensed soup, sour cream is the star ingredient in this casserole. Sour cream adds a slightly tangy flavor and incredibly rich texture. In place of fried onions, breadcrumbs are added to the top of the casserole. It’s much easier to find a real food option for breadcrumbs than it is for fried onions, at least for now. 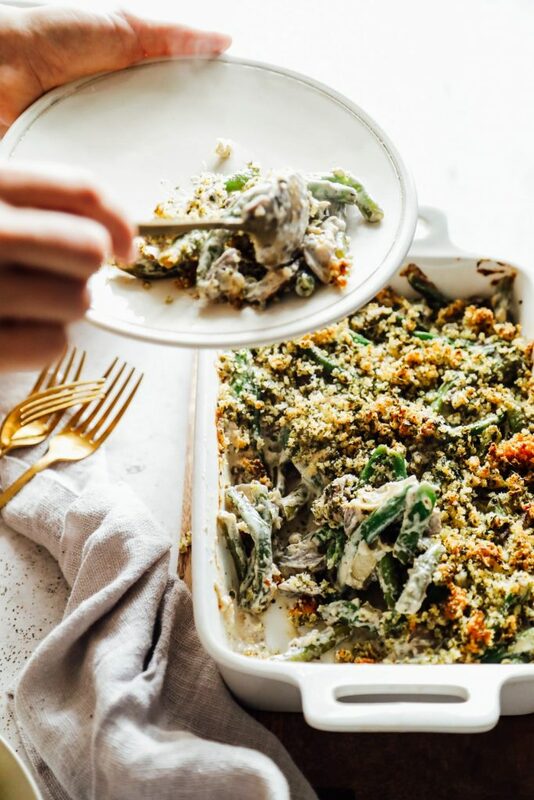 The final result is an easy-to-make, real foodified green bean casserole that even the processed food-loving folks at your Thanksgiving table will love. 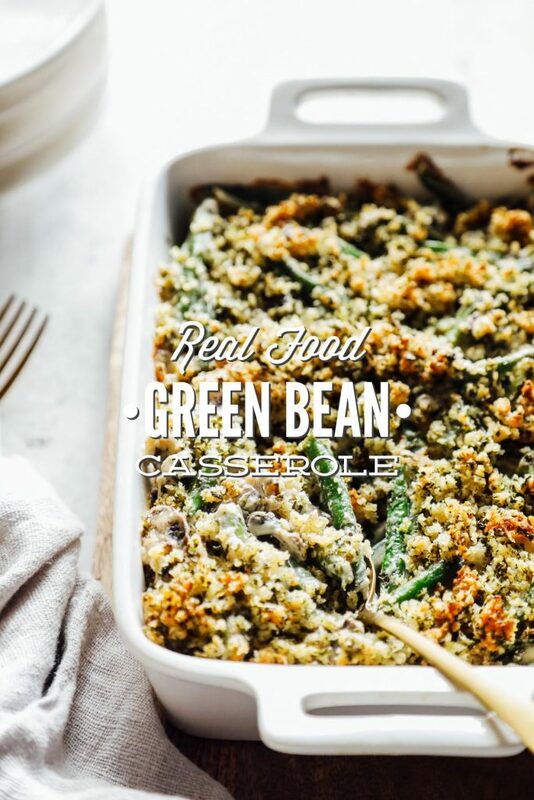 A homemade, real food version of green bean casserole. Made with sour cream in place of condensed soup. Fill a large pot (such as: a Dutch oven or soup pot) with water. Place the pot on the stove-top and bring the water to a rolling boil. Prepare an ice bath for the green beans by filling a large bowl with cold water and a handful of ice cubes. Boil the green beans for about 5-7 minutes. The beans should be bright green and still have a bite to them. We don't want mushy beans. Immediately drain the beans from the hot water (or use tongs to remove the beans) and plunge the cooked beans into the ice bath. Allow the beans to rest in the ice bath for 5 minutes and then drain the beans from the water. Add 3 tablespoons of butter to a large pot or skillet (I use the same pot used to cook the beans). Add onions and mushrooms and saute for a few minutes (3-4 minutes) to begin to soften. Stir in the minced garlic. Add the flour to the pot and stir to coat the veggies in the flour. Cook for a couple of minutes to get the flour taste out. Add the sour cream, mustard, salt, and pepper to the veggies. Once combined, add the cooled green beans and stir until the beans and veggies are well coated. To make the topping, in a small skillet or saucepan, melt 1 tablespoon of butter. Turn off the heat. Stir in the remaining topping ingredients: panko, parmesan cheese, parsley, and salt. Grease a small casserole dish (my baking dish is 10.5x 7--like this). Pour the prepared green beans into the dish, pressing them down to level. Top the casserole with the breadcrumb mixture. Bake for 18-22 minutes, until bubbling and topping begins to brown. Serve warm. *You'll need to use a substitute for the flour if you're wanting to make this gluten-free. My recommendation is to use an all-purpose gluten-free flour blend or something that subs well for gluten-based flours, like cassava flour. **Ian's brand makes a gluten-free panko (looks like this) if you're looking to make a gluten-free casserole. This brand does use canola oil, which I typically avoid, but it's the best option I've found for a gluten-free panko. When it comes to buying panko breadcrumbs, read the ingredient list on each option. 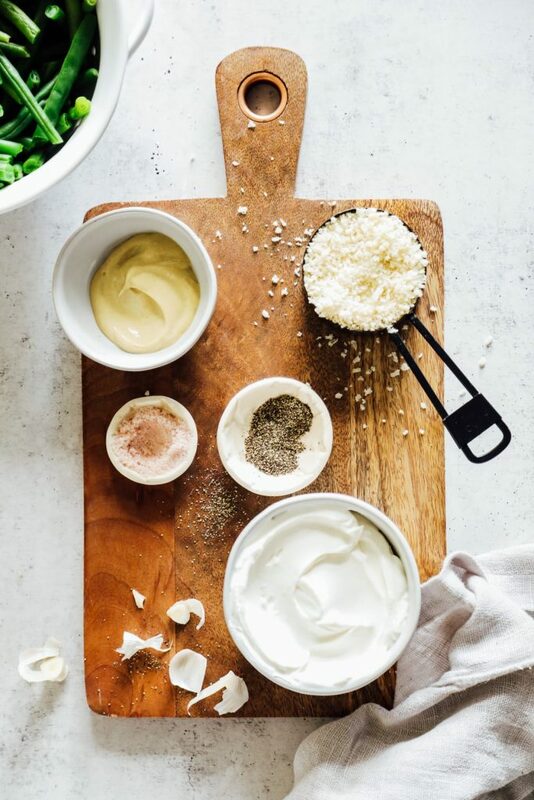 Stick to a breadcrumb with ingredients you can pronounce and would use in your own kitchen. You may need to visit a health food store (like Whole Foods) or look on Vitacost (like this brand) for such an option. I haven't found great options in the conventional stores in our area. I use Kikkoman panko. They also use canola but the list is short and includes whole wheat flour. They also make a gluten free option. Ooo, thank you for sharing, Helen. I’ll look for that brand. I have lots of home canned green beans from our garden. Do you think I could sub these for fresh? Hey Belinda, I bet you could. I’m guessing you wouldn’t need to cook the beans on the stove-top before baking the casserole. Love going to the market! My kids prefer their veggies a bit more well done so I sometimes boil them just a bit longer. Hey Little Plastic Footprint, Great, enjoy!! Excited to make this, this year for thanksgiving! I wasn’t able to find fresh green beans last week in my area do you think frozen would work? Excited to make this, this year for Thanksgiving! I wasn’t able to find fresh green beans last week in my area do you think frozen world work? Hey Ashley, I’m not 100% what the texture will be with the frozen green beans. But I think it’s worth a try. The green beans probably won’t be as crisp, but it should still taste good. Hey Kristin! Do you think I could assemble this or make it the day before? Should I leave off the topping and add it the day of so that it doesn’t get soggy? Hey Alex, I’m planning to do this. I’ve never actually tried making it in advance, so I can’t speak to the results. But I’m going to try it on Wednesday ;), and I think everything should be okay. I like your idea to leave the topping off–great idea. 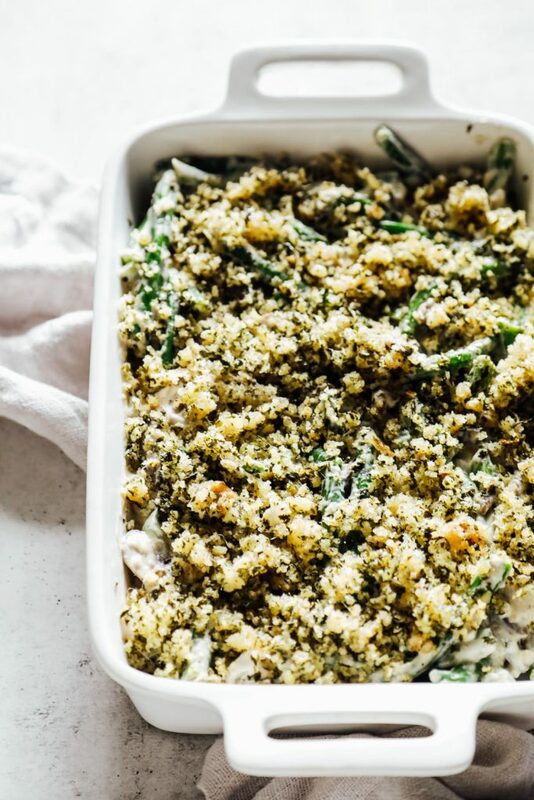 The topping is super easy to make, so if you make the casserole in advance, just make and add the topping just before cooking. Or maybe make the topping and store it in a separate container before sprinkling it on the casserole to bake. How did it come out to make the day before? I’m planning on doing this for Christmas. Did you make and store the topping separate and add right before baking, or make it right before and add it? I’m assuming you needed to add baking time for the cold casserole? And lastly (whew), think it would turn out ok if i doubled it and used a regular sized (9×12) casserole dish? I need to feed 9-11 people. Thank you! Hey Tamara, I ended up just combining everything and putting the topping on, then covering the dish and putting it in the fridge. I think it was bit more watery, but still really good. I think I cooked it for about the same time, but let the dish rest on the counter while the oven preheated. I haven’t tried doubling the recipe, but I think that should be okay. Yum, Kay! That would be amazing!